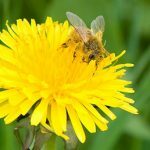 Winterization Of Honey Bees – Southwest Honey Co.
Have you ever been curious about where bees go in the winter? Why do we never see bees flying during the winter season? All insects have different ways of handling the cold of winter. Some hibernate, some die, and some stay right where they are. On January 10, 2016 we went to the hives with an endoscopic camera. We were happy to see them alive and well, huddled in their “winter cluster.” How cool is that! They have eaten through much of their food storage, most likely due to the unusually warm temperatures throughout December. We plan to keep an eye on them over the next month and be sure they do not run out of food before spring comes. Typically, honeybees halt their flying when the temperatures dip below 50 degrees Fahrenheit. At this time, they form what is called their “winter cluster” in the lower center portion of the hive. They keep the queen in the middle of their cluster and use their shivering body motion to keep the center of the cluster around 36 degrees. Since the outside edge of the cluster tends to be colder, the bees rotate and take turns so they don’t freeze. During the winter, the bees survive off of the honey they have stored up over the summer. It is said that the honeybees will consume up to 60 pounds of honey throughout the winter. This honey helps them produce body heat, which in turns results in energy. Heat energy comes from the oxidation of the honey and is spread throughout the hive when the worker bees fan their wings. On winter days when it is a bit warmer, the bees will exit the hive for quick flights in order to rid themselves of body waste. If bees can not get out for these short winter flights, the hive may suffer from dysentery if they are forced to excrete their waste inside the hive. These flights are kept short so the bees do not get so cold that they are unable to return to the hive. 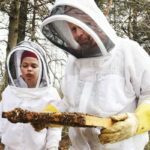 Before the first frost and before winter arrived, we at Southwest Honey Co., had some things to do to help the bees prepare for winter. First, we made sure that we moved all the frames containing honey were moved to the bottom brood box in the center (at this point, all honey supers have been removed so there should only be the 2 brood boxes remaining). This makes it easier for the bees to access their winter honey stores instead of having to travel throughout the hive to find them. Secondly, we inserted our entrance reducers back into the hive entrances (on the larger setting for now). We did this to avoid honey robbing, which typically happens in late fall from other insects such as yellow jackets. Since our hives are located near a treeline, they are fairly protected from the wind so we did not worry about putting up any wind blocks for the winter. Some people like to place bales of hay around their hives to keep out the wind and drafts. Others may choose to wrap their hives in roofing tar paper in order to attract the sun’s heat and keep the hive warm. Since the winter has been mild, we did not want to try wrapping this hives for fear that they may overheat. Just as a hive can get too cold, it can also get too warm in the winter. Another factor to consider when preparing hives for winter is starvation. Again, since it has been a mild winter with temperatures being over 50 on multiple occasions, even into December, the bees tended to be more active, therefore they consumed more of their honey stores earlier than usual. To combat the starvation, Alex and I built candy boards for each of our hives. These are the same length and width of the hive body and are 2 inches high. These will each hold about 20 pounds of candy and will give the bees an extra source of food to make it through the winter. The recipe called for 16 pounds of sugar and 3 cups of water. We used a large 5 gallon food safe bucket and large wooden spoon to mix the sugar and water. Good thing Alex has muscles because it was not an easy step in the process. Next, before pressing the candy into the frames we lined the bottoms of the frame with ½ wire mesh for support and then drilled a hole in the front of the frame to give the bees another exit and entrance from the hive. Finally, we lined the bottom of the frame (on top of the wire mesh) with wax paper. Before piling on the wet sugar, we added a small block of wood on top of the wax paper in front of the frame below the entrance hole so that this area would not fill up with sugar. We were finally ready to add the wet sugar. Once filled and packed in place, we used a wooden ruler to level it off. It took roughly 24 hours for the sugar to completely dry and harden. Once dry, we removed the wooden block that was covering the entrance hole. In late November we placed these sugar boards on the top of each hive (wire mesh side down) and placed the top cover back over them. We were careful to be sure that the ½ hole we drilled in the candy board frame was exposed so that the bees could enter and exit through this hole if needed. After this, we let the bees bed down for the winter and we checked on them in early January. It is best to leaves the hives closed up and sealed. The more you open the hive, the more heat escapes and makes it harder for the bees to maintain the appropriate temperatures within the hive. 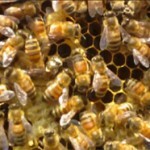 This entry was posted in Hive Checks and tagged bee, Beekeeping, cold, conservation, Fort Wayne, hive check, hiving, Honey Bee, snow, sugar candy, winter. Bookmark the permalink.